It's almost the end of August and what better time to go to Cornwall to visit some of the great gardens there? The school holidays are nearly over so the crowds are gone and you'll find many wonderful places to stay once the kids are back at school. 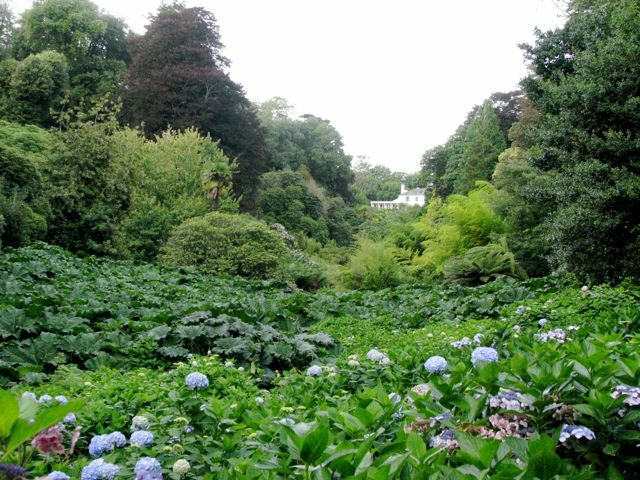 One of my favourites is Trebah (above) - one of several really wonderful gardens near Helston, where you'll find all one of the best hydrangea displays in the country right now. 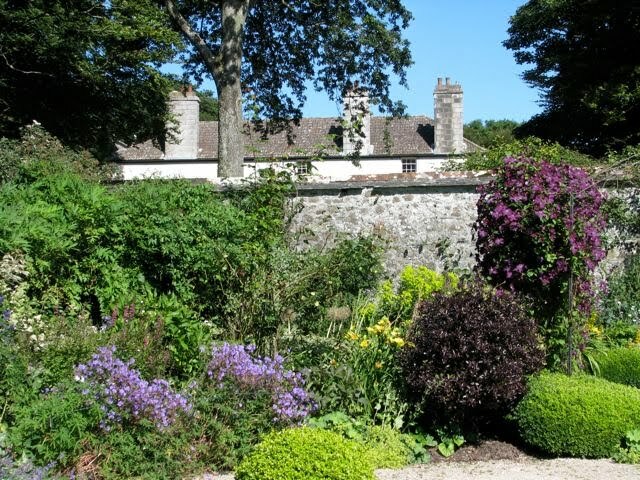 Trebah was purchased by Major Tony Hibbert and his wife Eira in 1981 and they've spent nearly 30 years making this garden what it is today. The 25-acre site is perched on the edge of a ravine that heads down towards Polgwiddon Cove on the Helford Estuary and you'll be treated to spectacular views of the sea as you wander through this magical landscape, and enjoy a walk on the beach if you feel so inclined. You'll find many rare trees here including the tallest Chusan palms in the country and wonderful swathes of gunnera that are reminiscent of Jurassic Park. Open all year from 10.30-5.00 (or dusk if earlier in deep mid-winter). Combine this a trip to nearby Bonython (above), which is open Tuesday to Friday and you'll see another very different garden, that has only been under development since 1999. This is another magnificent garden, with a large walled area (above) adjacent to the main house; many unusual South African and Mediterranean plants; and great swathes of ornamental grasses around the lakes (below). The new owners have been hard at work since they moved here 10 years ago and the planting throughout the garden is really striking - there's always something in bloom - but what will impress you is the bold plant combinations. The walled garden is glorious throughout the season and is filled with flowers and bumper-sized vegetables. Then there are the lakes at the bottom of the garden which lead into a woodland dell. 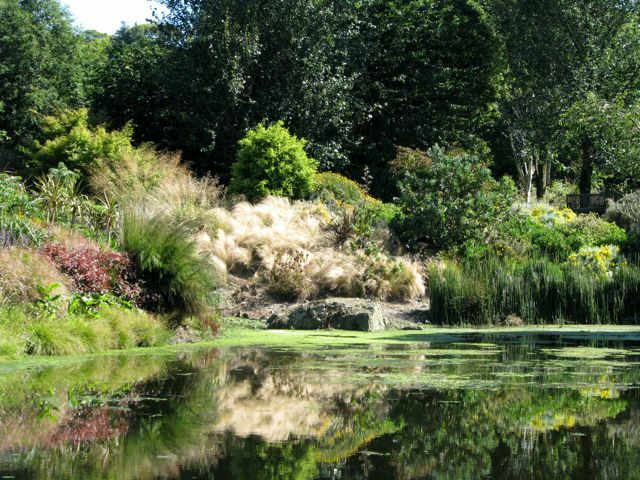 There's also a wonderful water garden adjacent to the 18th century house. Other notable gardens locally include Glendurgan (above) with its maze - also located on the edge of a ravine, although it should be said that this is more of a spring garden. And of course, if you're in this part of the country, you'll be able to treat yourself to a Cornish cream tea! I'm off to Cuba this week, where I hear there are some fantastic gardens, but I'm also told that internet connections can be slow, so if you don't see any posts for a couple of weeks, you'll know why! My favourite garden great at any season and the little beach at the bottom of the garden is the iceing on the cake. It's a beautiful area of the country. Those gardens look lovely and that maze looks spectacular! Like Bangchik, I also like the first photo the best. Interesting flowers and plants that lead to a central point; the castle/building. 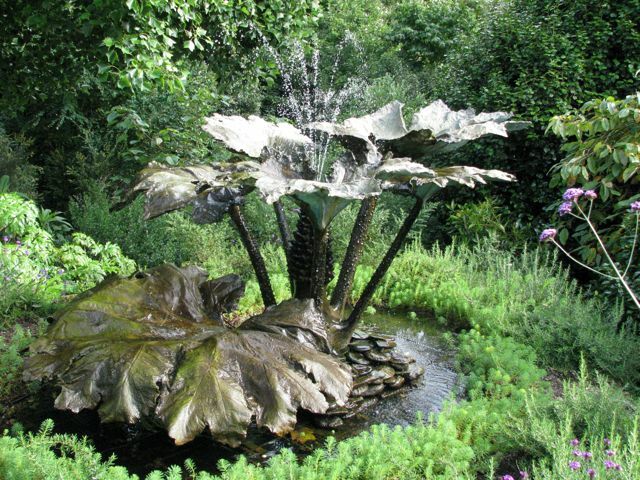 Just lovely...I heart that Gunnera fountain...and that maze...the stuff of dreams! The maze is just spectacular. How much fun it must have been to plan that. It almost looks oriental. Thank you for sharing these gardens. I just got home from watching the Shining tonight...but I still think the maze is great. Off to Cornwall at the end of this month, so thanks for the previews! Enjoy Cuba - it's a wonderful place. 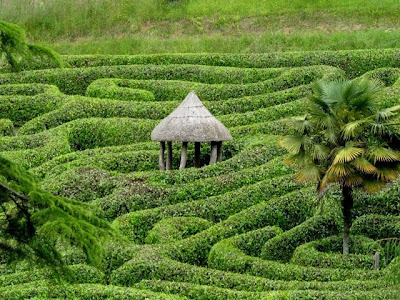 hello Charlotte the Glendurgan maze caught my eye...have fun in Cuba!